It's December and we have a few gifts ready for you. Many have asked for better support for US date and time formats, and now we have it for you. And for all of you it’s now easier than ever to select the follow-up time when you have finished calling a lead. We also have som good news for those of you who manage a lot of agents, and for those who need to know if a lead exists in a list they do not have access to. You can now select which date and time format you want in your myphoner interface. We added support for US formats mm-dd-yyyy and am/pm for time displays. Switching between default and custom time picker in myphoner. We tweaked and improved on the time picker for selecting follow-up time after calling a lead. You can select which day is the start of week (mon or sun) and the time picker will close automatically when selecting a day. Also, you can switch back and forth from the default selector to the time picker. Search result with read only lead from a non-accessible list. 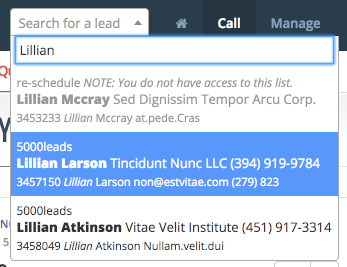 From your account settings, you now have the option to include leads from lists not assigned to the user when searching. These leads will only preview in the search result and they can’t be accessed. This feature is useful for agents with limited access, that need to check if they are adding duplicates to the system when manually adding new leads. Manages will find the interface under user management improved a bit to order agents by name and display their roles in a way that’s much easier to overview.